Paper Crafts by Candace: 3rd Annual Hello Kitty Blog Hop! Love this - what a cute start to the hop! This is soooo cute!! Love it! This is so cute. I love anything Hello Kitty! I didn't know what a kaiju was! A educational start to the hop! And very cute! Haha, so mean, but cute! This is an amazing cutie pie, so creative! 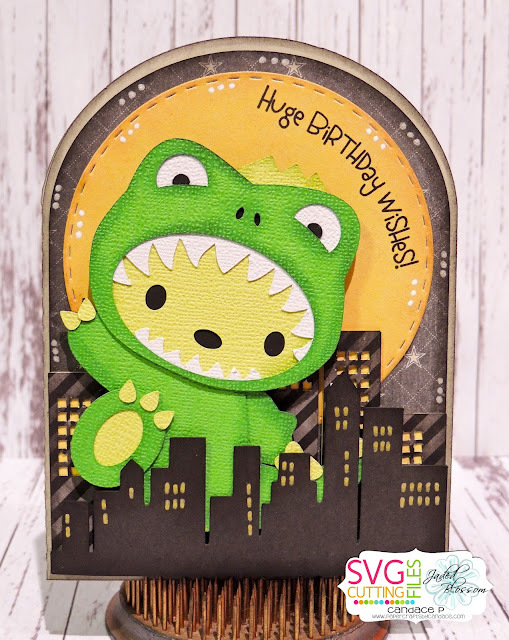 Aww so freaking adorable I love your hello kitty Godzilla and the city scape! Super cute!! Love your project. RAWR!!! OMG, OMG!!! This is so darned CUTE! Omg! What a way to open up the blog! ;) That is too cute!! I've done the last 2 Hello Kitty hops & have never been disapointed. :) I can't wait to see what everyone else came up with. Omg!😁😳 Great, job! What a big kitty! I love it! Love your Hello Kitty Kaiju! She is a very cute monster. Thank you for sharing. Have a great crafty day! What a great start, love it!! Godzilla is adorable. Love it. gorgeous..going to love this hop!! Really like this card.Great work. So Adorable!!! we love hello kitty! Holy moly! Stop it! Just stop it! This card is so fanfreakingtastic I just can't contain the squea! I don't like this...I LOVE IT! What a great start to an awesome hop!! Love your Hello Kitty Kaiju!! I love how she's stomping on all the buildings! Now that is a great way to start the hop. LOVE!!! Whoa! Godzilla is a great way to start a hop - good job! Hehehe! I love this! Too cute! Oh, a scary "kitty"! Too cute. Oh my gosh how cute is this!! This is great! What an awesome card! Love this! Very cute ! Love it. This is fantastic! LOVE the city scene and big moon behind HK! Great card and I love all your great touches. Thanks for your time and talent. This is absolutely adorable! The little scene you created was awesome! Such a cute card! Thanks for explaining Kaiju!! ooo she's so scary! lol. great job. This is so cute! Thanks for another hop! great sentiment with a great SVG! Love the foot in the air action!! Oh my goodness.. my grandson would love your card, thanks for the inspiration! OMG how super adorable is this! This is just such an adorable card! Great project! Love the colours. Oh My goodness, this is too cute. I love the Godzilla kitty! This is so cute!! I love the Annual HK Hop!! Awesome! Godzilla never looked so cute. I'm a huge Godzilla fan and just love this. This is the cutest Candace!!! OMG...Hello Kitty Kaiju stomping over the city it too darn cute. this is huge birthday card, so cute, I love it. What a fun card. I like the shape and the city scene for this cute Kaiju. Your card is sooo cute! Love the kaiju. Sooo cute! This is such an awesome card! Love the entire scene! Ahh! It's Godzilla!!! So cute, though. I love that you made a whole city scene for her to stomp on. Great job! That's pretty dang cute! Love it! In dinosaur that means cute! Great Project...can't wait to continue through the hop. So very very cute, thank you. Love it! The file and the card are great. Thanks! Your paper choice for this project is perfect. Adorable! I just started following you!!! Such a cute card ... thanks for sharing!!! Know just the little boy who'd love this card! Ahhhhhhhhhhhhh-mazing! I love Godzilla and your HK Kaiju is perfect! Definitely have to make this card . I love it it puts a smile on my face. Seriously cute! I love the Hello Kitty Godzilla stepping through the city. omgosh. this was so cute and made me giggle. great job.